Have you had some bad days at work recently? Do you find that you just can’t get enough sleep and are tired at work? 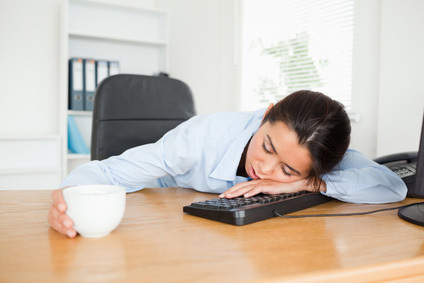 Do you find that you can’t focus at work because you are always feeling tired? If your answer is yes, it is likely that you have a sleep disorder which can affect your work performance. If you don’t address this problem soon you might find that the lack of sleep can affect your job performance. It may not be as good as it should be. It’s easy to miss deadlines if you’re not getting enough sleep at night and can’t concentrate. Not being able to focus at work may spoil your reputation and you could even lose your job. Patients with untreated sleep disorders may find them delve falling asleep in meetings, especially after lunch. Falling asleep in a meeting is not the impression you want to make on your boss. Patients who drive for a living have up to a 1500% increase in motor vehicle accidents do to excessive sleepiness and slower reaction times when driving. What is making you so tired? Even if you think you are getting enough sleep, you may not be getting the right quality of sleep. You need to reach a deep sleep state in order to restore your body and revitalize it for the day ahead. This won’t happen if you are continually waking up throughout the night. It could be that you are suffering from the sleep disorder condition known as sleep apnea. This condition happens when your airways become blocked from time to time while sleeping, causing you to wake up. It is something that can keep on happening all night and can rob you of your sleep. Another symptom of sleep apnea is constant, loud snoring and if you are unaware you snore, then your partner will soon tell you! If the fact that you can’t sleep properly means you are always tired, then it is time to do something about it before you find you have lost your job due to poor work performance. There are some dental sleep apnea treatments available that don’t involve drugs and one popular and successful one is the Thornton Adjustable Positioner (TAP). This device helps sleep apnea sufferers as it is placed in the mouth at night to open the airways. This allows oxygen to pass through the airways to the lungs without any obstacles in the way. The TAP works by forcing the lower jaw further forward, which prevents the collapse of your airway. This means that breathing can continue without disturbance. We ensure that the TAP is a good fit so that it does its job properly. You should notice the improvement in your breathing quite quickly and you should get a lot more sleep as well. If you are feeling tired all the time and know it is affecting the way you work, you need to find out the root cause. You should have your medical condition confirmed through a thorough examination. If you discover that you have sleep apnea or another type of sleep disorder then dental treatment can bring you relief from constant tiredness and better performance at work, too.